Honiara (Solomon Star): THE MALAITA Ma’asina Forum has urged the Prime Minister and the Minister of Finance to establish a bank for the country. The group made the call amidst moves the three commercials banks have taken not to do business with logging companies. Latest results suggest the commercial banks will close counts held by logging companies as of December this year. This action was taken as pressure from the proponents of the green economy mounts. Forum president Charles Dausabea said it is only right that Solomon Islands start its own bank. He claims what Prime Minister Lilo said in parliament by blaming commercial banks for their action is nothing but lame excuse. “We see his outrageous reaction to the issue as a show of how desperate he is, in keeping the truth,” he said. “The PM knows the issue of loggers with the bank but he tends to turn a blind eye and is trying to hide the truth. “His statements only belittle his character,” Mr Dausabea said. He said some politicians benefit more from loggers compared to landowners who received only 10 per cent in royalty payments. Mr Dausabea said the right reaction to this issue is for Mr Lilo and his finance minister to establish a bank for the country. 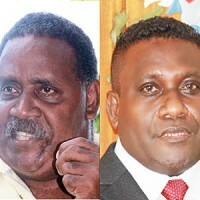 Mr Dausabea said whilst they welcome the initiative taken by the Finance minister to introduce a new bill to permit the Central Bank of Solomon Islands (CBSI) to issue an interim license to carry out limited banking service, Government establishing its own bank would be more meaningful. Forum general secretary Charles Ashley said Mr Lilo and Mr Hou must do the right thing by starting the country’s own bank.